The Longford Lectures have been running since 2002 and are held each November at Church House, Westminster. Well-known names as well as Longford Scholars (CJ Burge and Imran Shaukat, in a debate with Jon Snow for the 2018 Lecture – pictured above) reflect on prison policy and the need for broader social reform. The lectures aim: to provide a platform for national discussion; to make significant recommendations to policy makers; and to encourage debate about prison reform. From 2016 to 2018, they were sponsored by Unilink Technology Services. Past lecturers have included Nobel Laureate Archbishop Desmond Tutu , President Mary McAleese of Ireland, Michael Gove, Michael Palin, Ken Loach, Cherie Blair, Will Self, Martha Lane Fox, Clive Stafford Smith and Nils Oberg, head of the Swedish prison service. Watch the 2018 Lecture here. 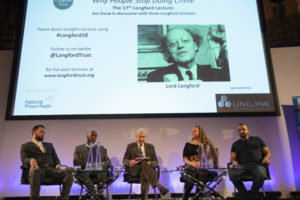 If you can’t be there on the night, join in the debate via our Frank Talks, short edited films of recent Longford Lectures, 20 minutes long and available free to view on this website. Why not share them with others and then sit down to discuss what is being said? To watch, read or listen to Ken Loach’s 2017 Longford Lecture, click here.